Join us for a fortnightly programme of presentations on music, literature, drama, film and visual art subjects on Thursday evenings from September to April. Guest speakers including artists, musicians, writers, and arts world experts share their knowledge on a wide range of genres. Non Members welcome: £5 per meeting. In this charming, romantic, comedy fantasy, Amélie, a waitress in a Parisian café sees it as her mission in life to change the world by changing the lives of her customers and her own in the process. In his lecture, George Eccleston will look at aspects of the poet’s life through the eyes of the women with whom he was associated. Who were these women, and what was their relationship with Burns, and what became of them? Many of his greatest poems and love songs were inspired by women and short extracts of these will be illustrated in the talk. Who inspired whom and who was the first to challenge the academic rules? By defining what avant-garde means in the context of 19th century art, Nirvana Rommel will test the common notion of French art being the pioneer in most things modern and highlights the British contributions to early modernism. Please come along and share your views and suggestions for the future development of Marple Exploring the Arts. The AGM will be followed by a film. Clark Art is one of the North’s leading art galleries and specialises in L. S. Lowry and Northern Art. Gallery owner Bill Clark will talk about how he became involved in Northern Art and how he came to set up his gallery in Hale. He will discuss the importance of L. S. Lowry and the influence he had on his contemporaries. He will also talk about the new generation of Northern artists who are documenting the people and landscape of the North in their own individual styles. Writing a book is not only about ideas and execution but also about editing, publicity and marketing. Author Paul Beatty’s talk will map the path starting from the initial idea to final publication and beyond for his prize winning novel, Children of Fire. A lively end of season concert provided by this talented group of musicians. The programme will feature a selection of music to suit all tastes from the Renaissance to the present day and from jazz to classical, including pieces specially composed for the group. The quintet, with clarinettist Emma Tennant, will present a programme of French music for wind including compositions by Taffanel, Ibert, Poulenc and a selection of movements from the Tombeau de Couperin by Ravel. These composers explore the colours of the different instruments and provide plenty of contrast and interest for performer and listener alike. Followed by wine and nibbles. From its very earliest broadcast from Trafford in 1921, through its formal launch in 1934 as the BBC Northern Orchestra, to its current identity as the BBC Philharmonic, Simon Webb, the orchestra’s current General Manager charts the role of the BBC’s orchestra for the North of England, past, present and future. At the turn of the 18th - 19th century a changing view of humanity and society emerged. In the Arts it is called Romanticism. In his talk, David Seddon, will attempt to characterise the Romantic Movement in music, literature and painting and to fit it into the political changes that were taking place. We shall meet Beethoven, Wordsworth, Coleridge and Turner, not to mention Rousseau, Paine, Nelson and Napoleon. Manchester Art Gallery is home to one of the largest collections of Dutch 17th century paintings in the UK, outside London. Not only do they provide us with fascinating glimpses of life during such a dynamic and exciting epoch, they almost certainly contain hidden meanings which the intervening centuries have hidden from us. And thus we find ourselves bewitched by their profound sense of mystery. Artist Rebecca Eastment and gallery tour guide John Ward will be seeking to illuminate the way. Loving Vincent is a biographical drama film about the life of painter Vincent van Gogh. It is the world’s first, fully oil painted animated film and brings his artworks to life in an exploration of the events leading up to the death of one of history’s most celebrated artists. Why did horrified officials at Stockport Unitarian Church shut down their dramatic society? Elaine and Steve Pratt will uncover the mystery in their illustrated talk. The Garrick has an extensive archive dating from 1901 to the present day, full of amusing stories and interesting facts, charting the history of one of the UK’s oldest Little Theatres. Mart Rodger and His Jazz FiveOur pre-Christmas celebration will be a night of lively entertainment for music lovers with this well loved local jazz band. 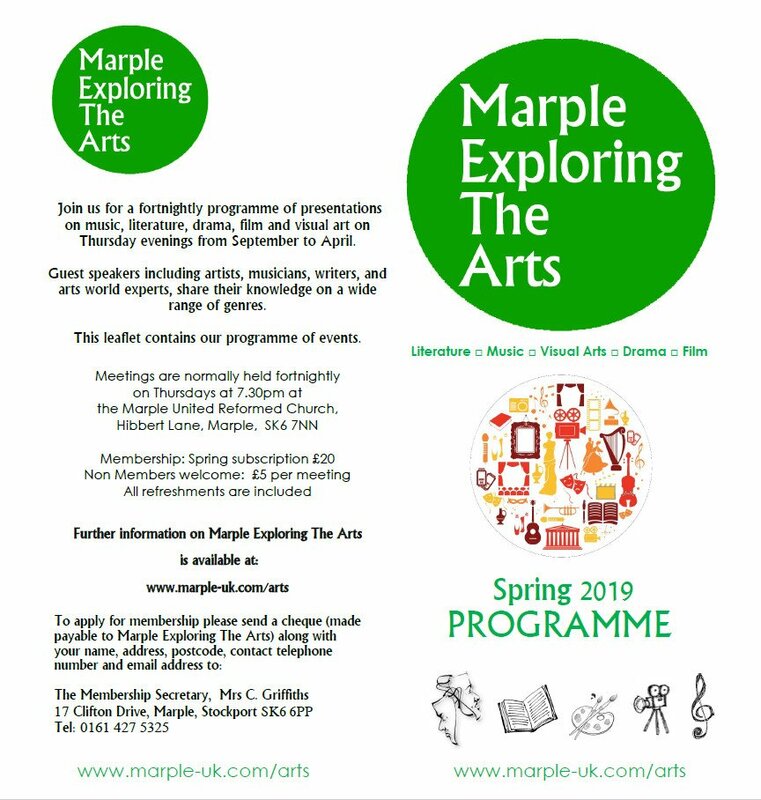 This thread is for the latest programme of Marple Exploring the Arts.